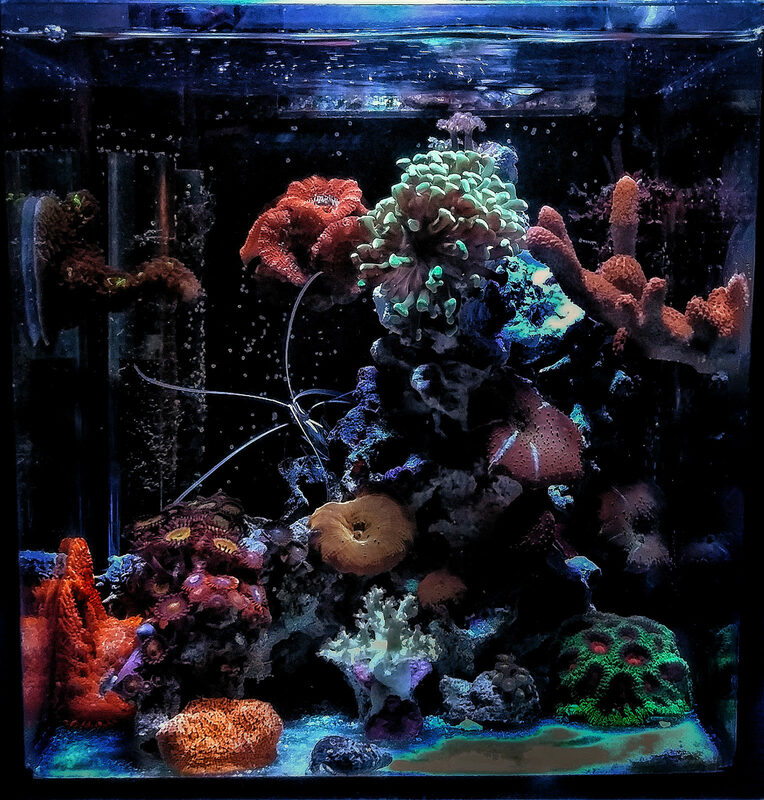 Congratulations to community member TheRope and his 3 gallon pico reef for being selected for our April 2019 Reef Profile! 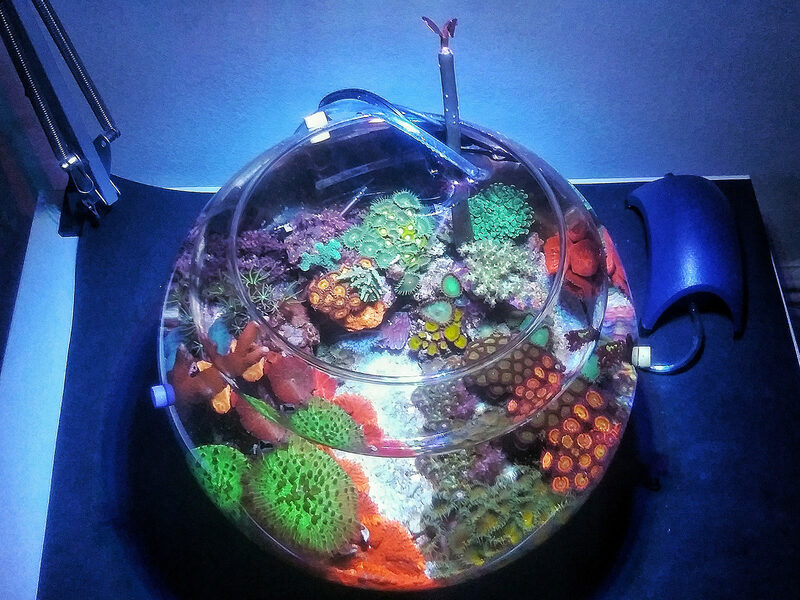 This fascinating pico reef bowl is home to an incredibly diverse array of aquatic life, all built upon basic equipment and simple care. 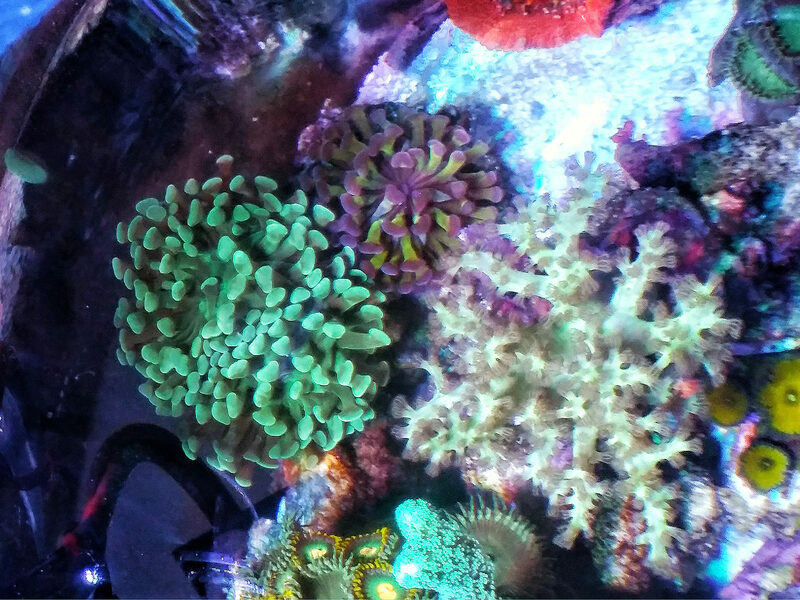 In this article TheRope shares his experiences in the hobby and this aquarium's journey over the past year and a half. 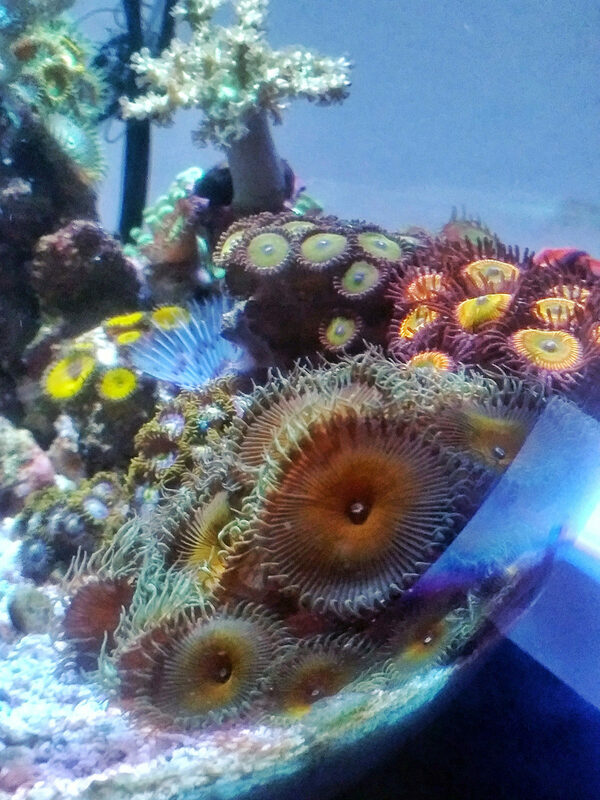 Share your comments and questions in the comments section below, and follow his aquarium journal for additional photos, history, and information about this mesmerizing little reef tank. Display: 3 Gallon glass bowl, 10" wide and 9" high. Total system water volume about 2 gallons. Lighting: 12 watt PAR38 Tuna Blue LED by ABI in an IKEA desk lamp. Heater: 50 watt Aqueon Mini paired with Inbird Thermostat. Air Pump: Tetra Whisper 10, dialed down a bit. Rock: A mix of live rock and Caribsea “Life Rock”. Sand: A mix of Fiji Pink and Arag-alive from Caribsea. I do one water change per week, at minimum 50%, but usually closer to 90%, and I feed often. My water changes are done with store bought distilled water that I mix with RedSea Coral Pro salt to the right temperature and salinity. 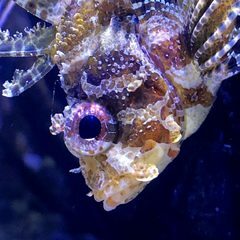 Normally I feed a tiny bit of ReefRoids with an added couple of drops of Seachem phytoplankton, as well as spot feed certain corals with LPS pellets. I feed all of these foods at the same time 3x to 4x a week. 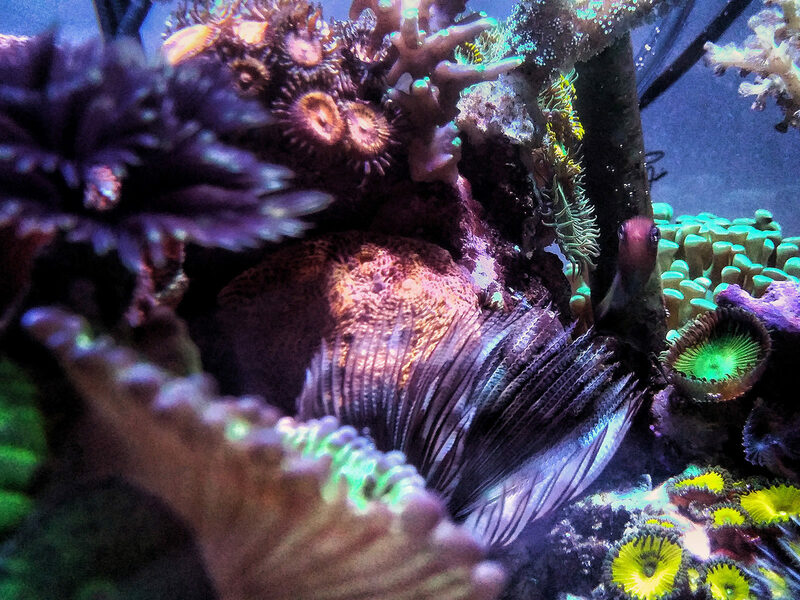 My feather worm's health is very important as the large water changes often deplete the water column of things that these heavy filter feeders need. So it's my job is to replace it while still keeping my coral alive! For testing, the only thing I check is salinity and temperature. I test salinity with an ABI refractometer once a week after doing a water change, and the temperature is digitally monitored by the Inkbird Temperature Controller. I typically only top off for evaporation once a week. I know when it's time to top off because I draw a line on my bowl after every water change showing me where my water level is. If there is any evap that escapes the lid, I just slowly raise the water level back up to that line and it's always spot on. The air bubbles used for water circulation the reef bowl acts as a form of surface skimming, the buildup of 'skim mate' waste appears above the water line around the edge of the bowl, which I simply wipe down once the tank is drained for a water change. To assist with my heavy feedings I also have a small mangrove growing in the bowl to help reduce my nutrient levels through nitrogen uptake. 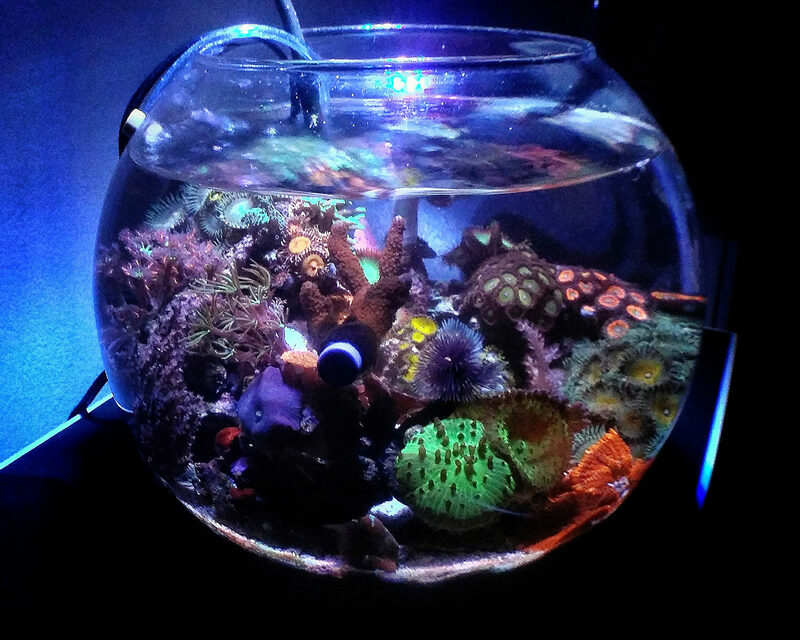 I originally started this reef bowl in a 2 gallon Anchor Hocking glass cookie jar In August 2017 after seeing a ton of images online about Maritza the Vase Reef, it comprised of 3 rocks and a sand bed. I ran it using an air pump, a heater, and an eBay light. 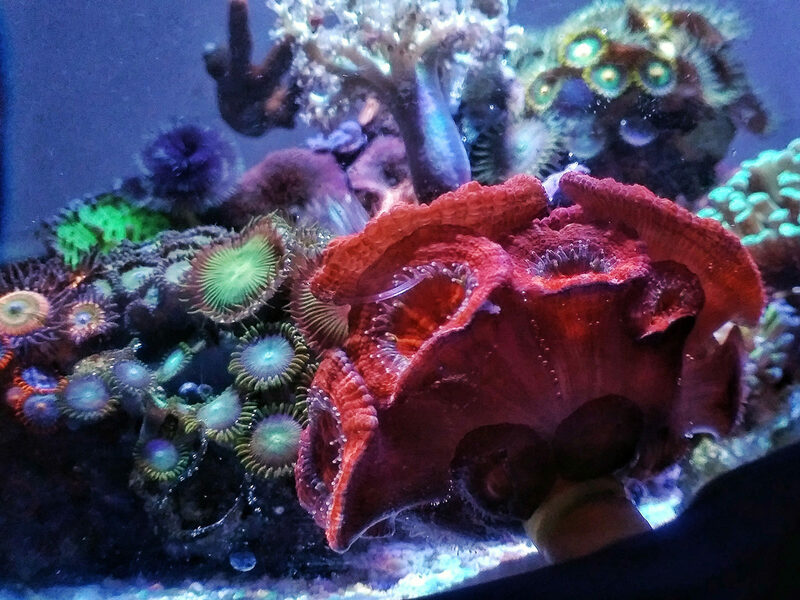 The eBay light I originally started with was very white and way too weak, which caused my acan frag to go from red to green. That's when I went online and found the ABI tuna blue PAR38 LED bulb that I have been using ever since. The sand I had used in the original jar was very large grained, which allowed it to be the perfect host for deep rooting nuisance algae. At the time I was an absolute peroxide freak, and the one problem spot I couldn't spot treat with peroxide was the sand bed, so I just removed it all together. The removal of the sand bed caused the rocks to slide and crush coral to the glass due to the shape of the cookie jar's base. Over time I started falling in love with the typical aquarium shape, and I thought it would be the perfect opportunity to switch the corals over to a mini cube, with a much flatter and less coral crushing option. This setup was quite the improvement, or so I thought. I had an AquaClear 50 filter on the back with chaeto macro algae growing in it, and everything was going super smoothly until I realized how much water I was losing to evaporation, about an inch a day. Needless to say this traditional aquarium setup only lasted about 3 months. I finally decided to jump back into a reef vase styled setup and plopped all the rock and coral from the 5 gallon into this final permanent bowl setup with a deep sand bed. The reason for the deep untouched sand bed (besides stability) is the incredible creatures that come to inhabit it! 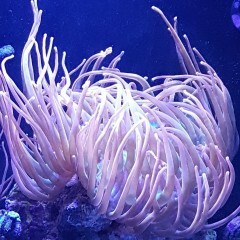 I'm an absolute fanatic for marine worms, but beyond that, this setup is literally fool proof and is by far my favorite due to its simplicity, lack of problems, and it overall just looking like an odd piece of living art. I started in the hobby after a trip to Croatia where I fell in love with the sea. After doing some research I realized the diversity of species that one can house in our home aquariums, I quickly became obsessed with the hobby. At the time I was a student and didn't have much of a budget, nor the space to fit anything large in my apartment. I eventually fell upon Maritza the Vase Reef and Brandon Mason’s vases which instantly inspired me due to the hands on approach as well as the cost effectiveness of these small setups. 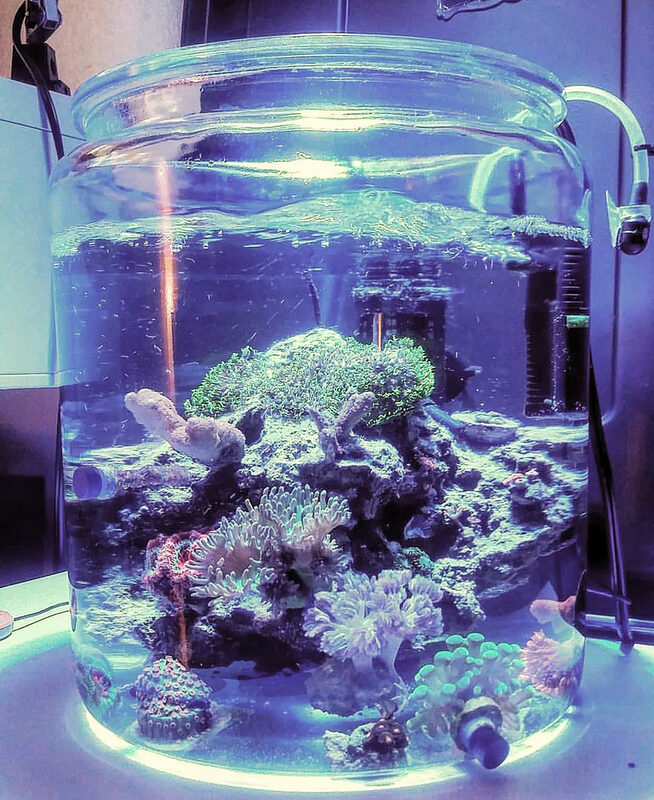 Seeing multiple species of coral surviving in such a small space without all the expensive equipment spiked my interest, and after doing a significant amount of research on coral, maintenance, pests and all the information I could find I started the reef jar. Starting this tank with Brandon Mason's help was very different from how most people start their tanks, which I only learned later on. I did no testing to determine if my tank was cycled. I was simply instructed to smell my rock to see if it smelt of the ocean, and to inspect it for microfauna. 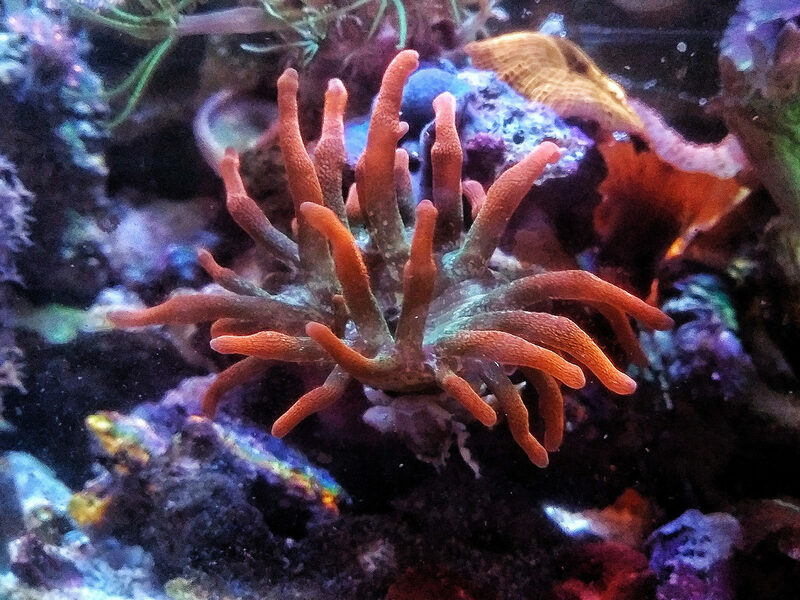 Both of those criteria checked in and two days after setting it up, I had my first coral. 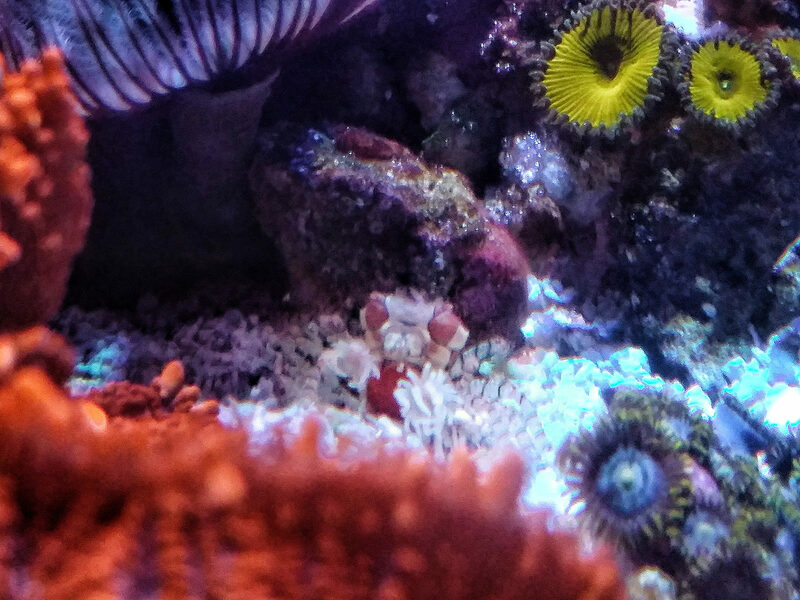 Over time I started leaning towards keeping soft corals due to their hardiness and shape, as well as easy manageability in such a small space. 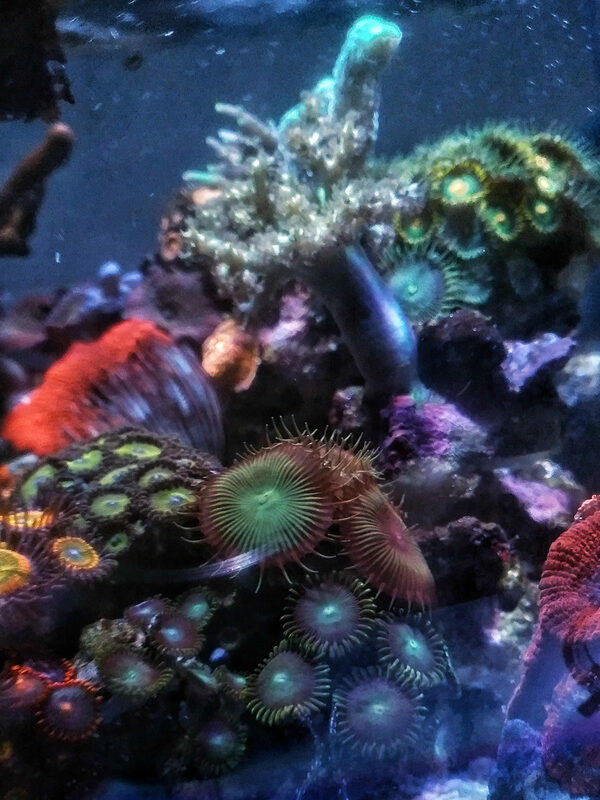 They fill in very well and can often coexist well with other coral types. 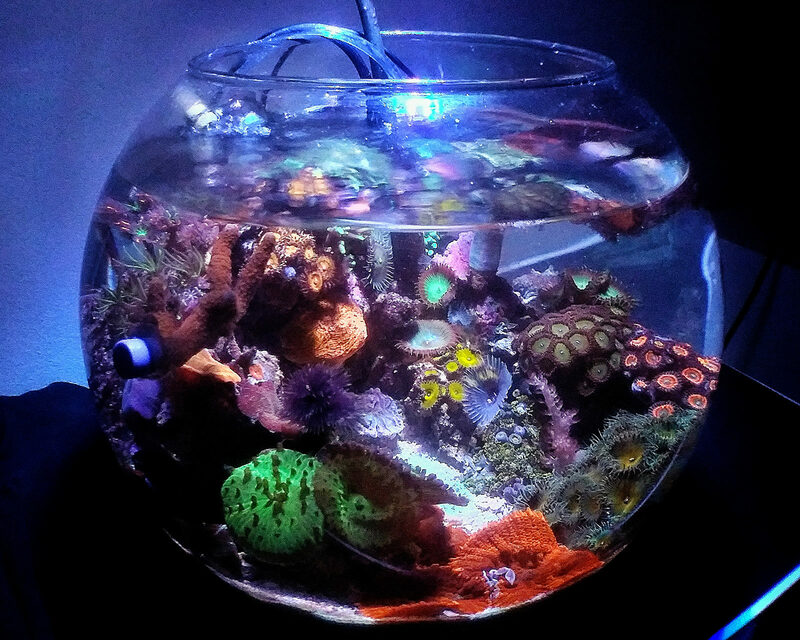 So my bowl took a turn from being SPS and LPS dominated to eventually being soft coral dominated. There has only been one disaster that I very recently combatted. I bought an immobile Coco Worm with no tube in an attempt to save it, but it quickly decayed and released mucus throughout my whole tank, nearly killing everything other than my palys. Though I was worried, I didn’t really panic. 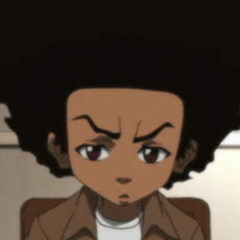 The reason for the calmness was that I knew exactly how to fix the problem. Having such a small system allows for some quick action that would be much more difficult to do in a large tank. I simply removed the worm, sucked up all the mucus, and did a 100% water change every day (3 days) until the coral bounced back. I had only one loss from the incident, a section of my birdsnest was hit directly with the mucus and died of rapid tissue necrosis, but I fragged it and saved enough to make another frag. 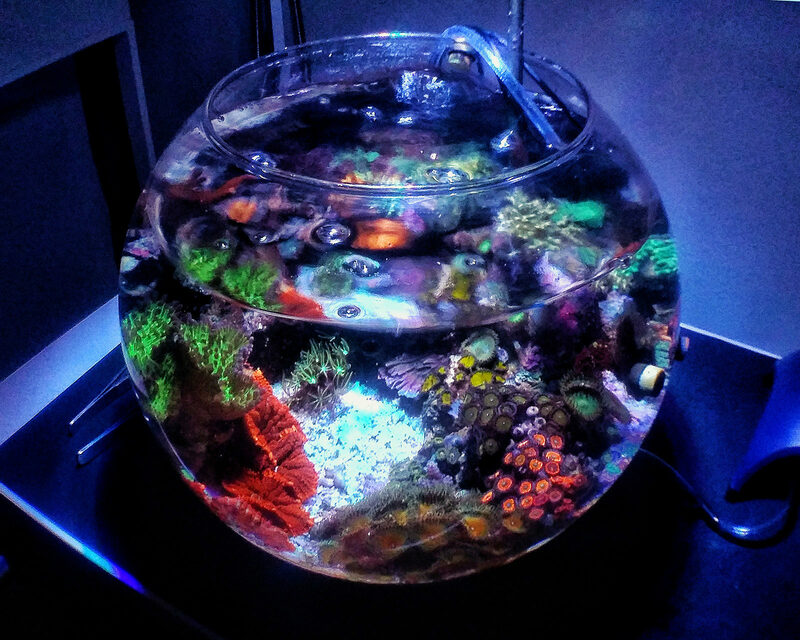 This type of manual reefing is what got me really interested in these small setups, it allows me to have 100% control of any situation in the bowl. 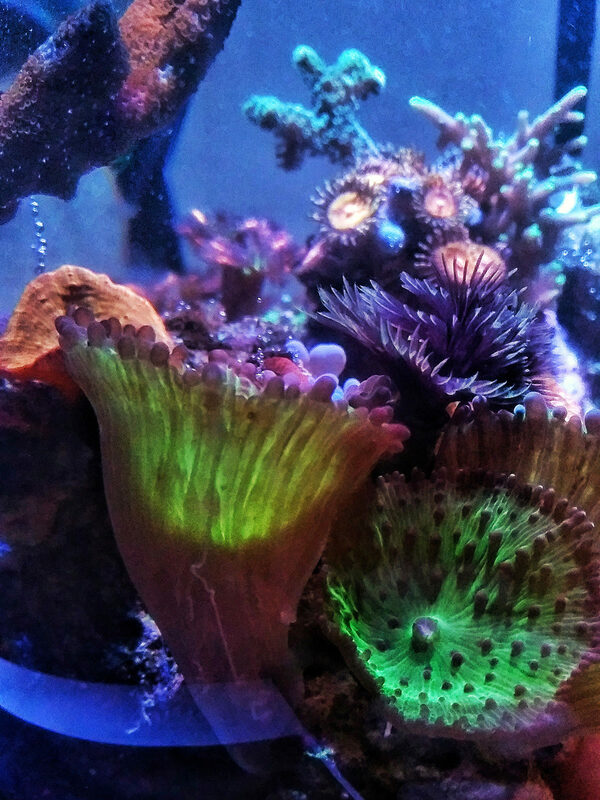 Almost anything that is harmful in water quality can be solved by a 100% water change which is why I do not bother to test the water, I simply observe my coral because in the end any problem I encounter will require a water change to fix as I cannot add carbon, or dose anything, in this simple setup. My biggest tip for new reefers and reefers in general is do not chase ideal parameter numbers. 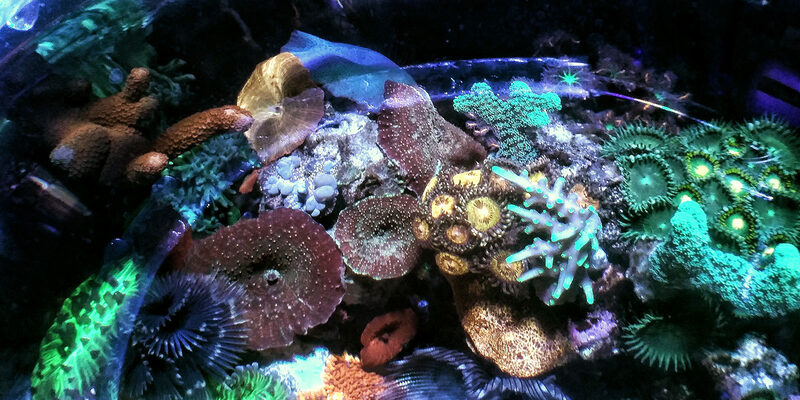 Numbers are different for every tank, we do not have the same amount of coral, rock or sand. So these parameters are all just a very very very rough guideline. You have to observe your corals, these are your indicators. Also testing in general, in my opinion, can be counter intuitive due to the fact that there are natural things in your tank consuming nutrients and you'll often get false readings. For example: people who have algae problems test their tanks and say that their readings are good but they still have algae issues! The reason the readings are good is because the problem algae is consuming your high nutrients so you will always get a reading of zero. Until you eliminate the problem there is no way you can test properly. For these bowl setups you really do not need to feed as much as me, once before a water change per week or every two weeks will suffice. I only do this for the health of my many tube worms, so this kind of system setup is essentially even simpler than I currently have it. I do not really believe in them, though I do find acropora and bounce shrooms very beautiful, they are not my favorite coral. My favorite corals I’ve actually gotten for free from my LFS. Large polyped palythoa are my absolute favorite coral of all time, and my LFS throws them at me because they’re invasive as heck! 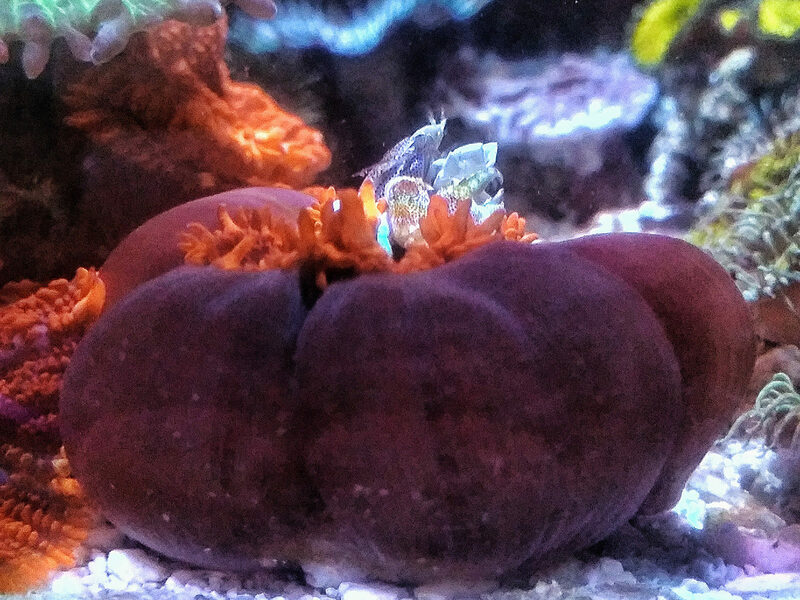 All that I mean to say is to find the coral that you enjoy observing most, because in the end you’re the one watching your tank and doing the maintenance, and people will always enjoy seeing healthy colonies of any coral no matter how much they’re worth! 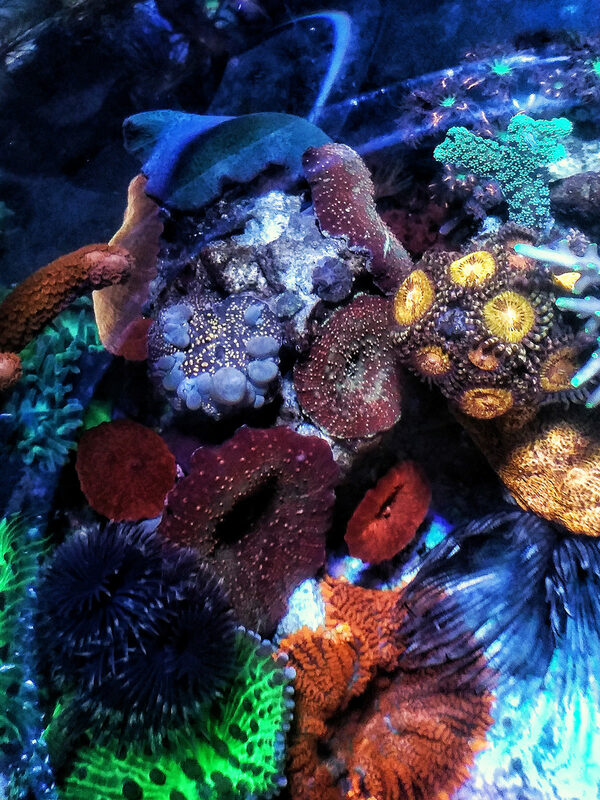 You have so many beautiful corals and other livestock packed into such a small space, and I agree, it looks like a beautiful piece of living art! I was especially interested to see the transformation that occurred with the transfer to the different tanks. Heyyyy congratulations! Can’t wait to get home and read your write up. Thanksss! Your tank is still one of my favorite!